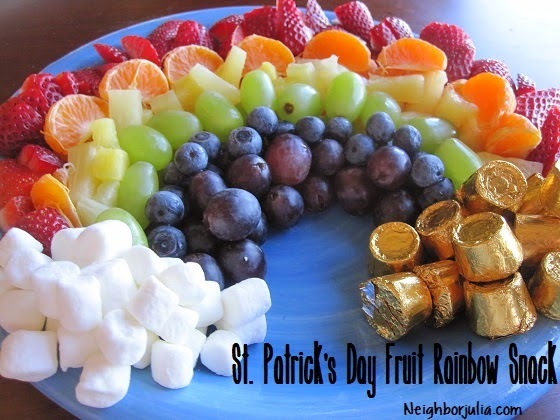 Neighbor Julia: St. Patrick's Day Fun! Here's a fun treat! A fruity rainbow complete with marshmallow clouds and chocolate treasure! It was very quick to put together and I could barely keep my 3 year old from eating it so that I could take a picture. My wonderful husband is sending me out for a girls weekend out of town with some friends...so I decided to make a few surprises that he could give to the kids for St. Patrick's Day tomorrow. But when you have 4 daughters rainbows can be a delicious snack any day of the year so I'm sure I'll be using this again! Have fun! So cute! Almost all healthy!